Ella Rhodes on a recent British Psychological Society report. While approximately one in four children and young people show signs of a mental health problem only around 25 to 40 per cent of them receive help from a mental health professional – if at all. The evidence on psychological support in schools and colleges has recently been reviewed by the British Psychological Society Faculty for Children, Young People and their Families. 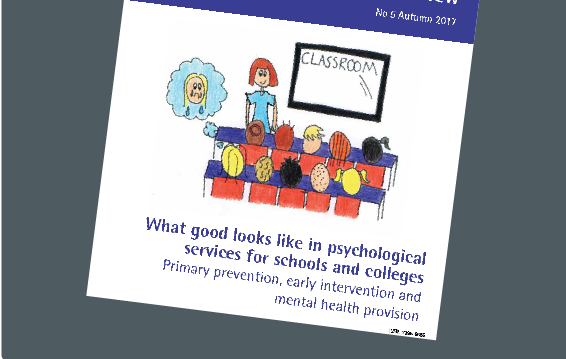 What Good Looks Like in Psychological Services for Schools and Colleges: Primary Prevention, Early Intervention and Mental Health Provision discusses the practical ways in which psychological wellbeing can be addressed in school settings, as well as the implications for commissioning and delivery of provision. The document is free to access and also contains various case studies of applied psychologists working with individuals, schools and services. The review makes 17 recommendations including the need for a better system to recognise problems early on to ensure the right help is provided at the right time – and to reduce the strain on CAMHS services. It suggests that the Department of Health and Public Health England should be involved in developing national policy, guidance and interventions to reduce known risk factors based on psychological evidence. To help those who may not traditionally come to clinical services, the review proposes the provision of specialist support in schools, including CAMHS teams. The authors also recommend giving teachers and school staff more training and support to help them identify when a child or young person’s distress exceeds normal levels, for example after a bereavement. The review emphasises the importance of taking a holistic view of children, young people, their schools and families, and recommends involving families in decisions about the support a young person receives. The authors also suggest creating a whole-school culture that encourages social cohesion and discourages bullying. They also highlight the needs of children and young people with chronic physical illnesses and disabilities who are at an inflated risk of developing mental health problems.